At the heart of environmental protection is risk assessment: the likelihood of pollution from accidents; the likelihood of problems from normal and abnormal operation of industrial processes; the likely impacts associated with new synthetic chemicals; and so on. Currently, risk assessment has been very much in the news--the risks from BSE and E. coli, and the public perception of risks from nuclear waste, etc. This new publication explains how scientific methodologies are used to assess risk from human activities and the resultant objects and wastes, on people and the environment. Understanding such risks supplies crucial information--to frame legislation, manage major habitats, businesses and industries, and create development programmes. Unique in combining the science of risk assessment with the development of management strategies. Covers science and social science (politics, economics, psychology) aspects. Very timely - risk assessment lies at the heart of decision making in various topical environmental questions (BSE, Brent Spar, nuclear waste). 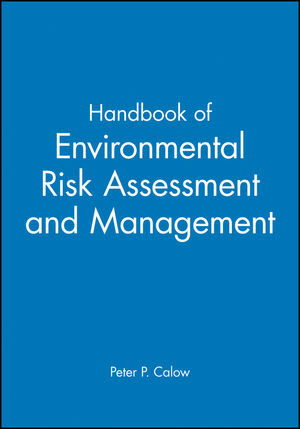 Peter P. Calow is the editor of Handbook of Environmental Risk Assessment and Management, published by Wiley. Psychology Of Risk And Uncertainty. Economics Of Risk And Uncertainty. Assessing Risks To Humans From Chemicals In The Environment. Assessing Risks From Chemicals To Ecological Systems. Assessing Risks From Gmos To Human Health And Ecosystems. Assessing Risk From Biological Introductions For Ecological Systems. Retrospective Analysis, Ecological Monitoring And Epidemiology. Retrospective Analysis Covering Human Exposure To Environmental Risks. Application Of Risk Assessment In Policy And Legislation - European Union. Application Of Risk Assessment In Policy And Legislation - North America. Corporate Chemical Management: A Risk Based Approach. Risk Assessment And Management In The Nuclear Industry. Risk Assessment And Management For Waste Disposal. Risk Assessment And Management In Land Uses And Treatments. Risk Assessment And Management In The Exploitation Of The Seas. Risk Assessment And Management For Inland Waters. Environmental Risk Assessment In Running A Business. Risk Assessment And Management In Product Design. Environmental Risk Assessment In Development Programmes. Liability, Insurance And Environmental Risk.